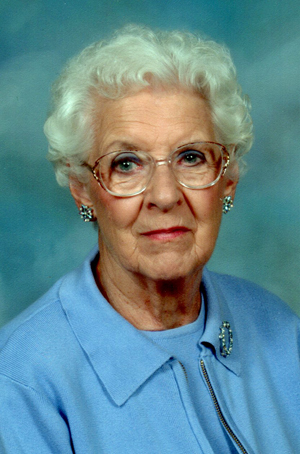 Genevieve Ann Seibert, 100, went home to be with the Lord on January 17, 2019. She was born June 26, 1918 in Kenmore to Daryle and Ruth Starkey. She attended Maranatha Bible Church and Hope United Methodist. She graduated from Kenmore High School, was active with the Kenmore AARP, and delivered to shut-ins for Mobile Meals, which gave her great joy. Genevieve enjoyed sewing, cross stitching and knitting, making clothes for her family which she often designed. She was always willing to give of herself and enjoyed helping others. Genevieve was preceded in death by her husband of 30 years, Linton Fred Seibert; brother, Edward Starkey; and sister, Margaret Bitting. She is survived by her son, Linton R. “Chip” (Mary Ellen) Seibert; grandchildren, Jennifer A. (Steven) Foster, Christine (Todd) Veppert, and Lori (Scott) Fisk; and great-grandchildren, Brooke and Lauren Foster, Joshua and Michael Veppert, Tyler and Shawn Fisk. Private services have taken place. Interment Greenlawn Memorial Park, Akron, Ohio. In lieu of flowers, donations may be made to Akron Mobile Meals in memory of Genevieve.